The countdown is on till the Self Management Network Scotland’s national networking event! Bringing together members from across our 700 strong network that live and work across all of Scotland’s 32 local authorities, these events are a fantastic opportunity to discover what self management activity is happening and bring together like minded people to share learning and spark ideas for future activity. The SMNS networking day is really about its members and creating that space for them to share what they have learned, what support they are looking for and celebrate their work. There will be lots of inputs from SMNS members throughout the event, so you are hearing from them directly. 2. Lots of tea and coffee! It is a networking event, and what is a networking event without a decent cup of coffee?! The Studio is a great event space; airy, open rooms with lots of natural light but arguably one of it’s highlights is the fancy coffee machine that delegates can use at any point during the day. It’s been a busy time for the Self Management team and the wider ALLIANCE, so we are looking forward to sharing some exciting announcements on the day. As a delegate, you will be the first in the know and have a chance to ask us questions, arrange catch ups etc. We know that life and work is busy, so our networking event is a great opportunity to catch up with colleagues and peers you haven’t seen in a while over a cup of coffee (see number 2). One of the great things about the SMNS is the diversity of our membership. All you need to join is an interest in self management so we have members working across the third sector, local authorities, health and social care professionals, academics, the private sector and people living with long term conditions, disabled people and unpaid carers. Our national event will bring together a range of these members so it will be an exciting cross-sector space and a chance to hear from a range of different perspectives and experiences to grow your knowledge and understanding. This workshop will draw on our recent learning from network members and create the space for everyone to input. Drawing on different themes that have been raised by network members, this will be an opportunity to discuss learning with other members interested in similar areas and look at opportunities and possible future actions. What do you need to know when applying for the Self Management Fund? This workshop will address those nitty gritty questions from who should write the application, do’s and don’ts and what support to expect. A don’t-miss for any third sector organisation considering applying for the Self Management Fund. A day of networking and conversation can be superb, but we know that it can sometimes be tiring, so we want to make sure you can take some time to recharge. You’ll have the option to join COPE (this link will take you away from our website) for a workshop on mindfulness and tips on how to live in the moment. We are encouraging delegates to register themselves and a friend for the day. Whether that’s a colleague who has never been to a SMNS event before or a friend living with a long term condition who is new to self management altogether, we would be delighted to welcome them on the day so they can find out more. It’s been 10 years since the Self Management Fund, administered by the ALLIANCE on behalf of Scottish Government, began. Since this time we funded over 275 organisations supporting people to self manage – a fantastic achievement. We are delighted to bring together some of the previously funded and currently funded organisations to share with us what they’ve learned. 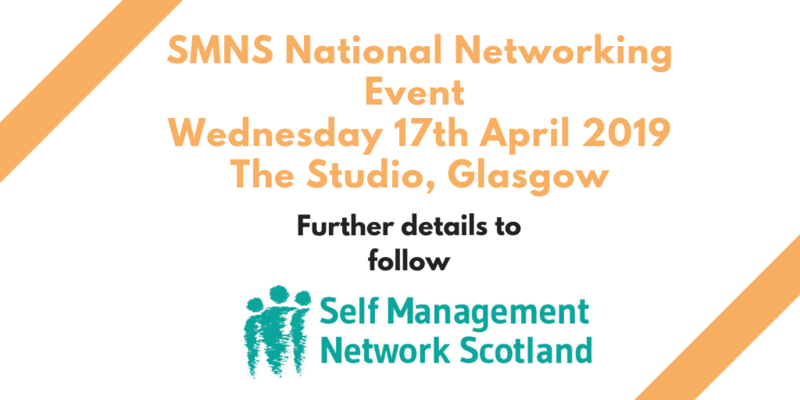 Register your attendance at the Self Management Network Scotland National Networking Event, 17th April, Glasgow here.